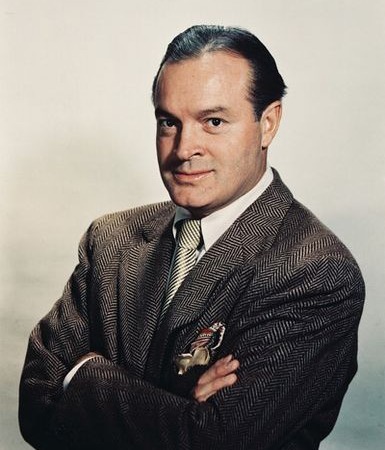 Bob Hope died in 2003 but he still ranks amongst the very greatest performers of radio, film and television. As well as being the master of quick-fire comedy in all forms of media, this immensely talented man was also a producer, a writer, a dancer, a singer and one of the world’s greatest earners for good causes. Passover”) 18 times and was famous for his hard working trips to entertain the troops during World War II and the Korean and Vietnam wars. In 1997 he became the only person ever to be made by Congress an honorary US veteran. He was made an honorary knight by Queen Elizabeth II in 1998, and by the end of his life had received five special Academy Awards for his contribution to the entertainment business. Read about ‘The Paleface’ starring Bob and Jane Russell. This entry was posted in 1940's, 1950's, 1960's, Actors and tagged actor, bob_hope. Bookmark the permalink.